Fetus in fetu (or fœtus in fœtu) is a developmental abnormality: a mass of tissue inside the body that more or less resembles a fetus. There are two theories of origin concerning fetus in fetu. One theory is that the mass begins as a normal fetus but becomes enveloped inside its twin. The other theory is that the mass is a highly developed teratoma. 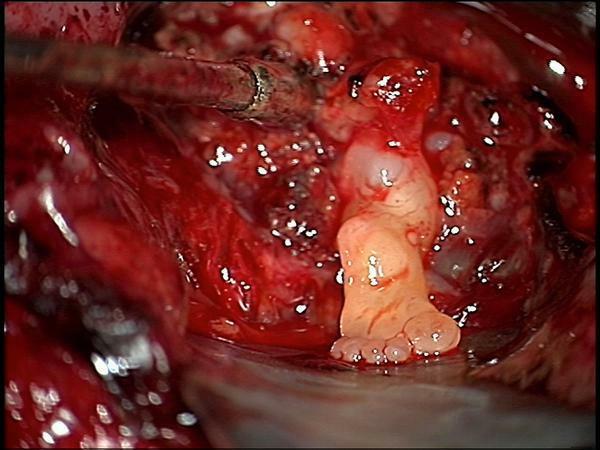 Fetus in fetu is estimated to occur in 1 in 500,000 live births. It’s not quite as exciting as the foot found in the boys brain down in Colorado Springs (warning: very graphic photo [photo credit to the Denver Post]. DO NOT click if you are at all squeamish). But I was still pretty thrilled with my little discovery. My mature, and fully ripened, red pepper was carrying it’s own underdeveloped green pepper twin inside it. Of course I took pictures. And here is a picture of the with the fetus extracted. Alas, teratoma peppers are not all that uncommon. Wow. You just gave that pepper an abortion, murderer. Thanks for giving this a name, I found a bell pepper fetus last night! Fascinating! This is cool, My wife found a small green bell pepper inside an orange bell pepper tonight. First thing I thought was Fetus In Fetu as well. Pretty dang cool, all the bell peppers I’ve seen in my life and this is the first and likely ONLY one I’ll ever see in my life! Incredible!! I found one tonight in my orange pepper. Extremely interesting!!! !